While these are fine (and, in truth, are the basis for what I know about the conversion system), they are not as explicit as I would like. So, in an effort to clarify the conversion system both for myself and (hopefully) others, I wrote this little primer. I'll step through a full example showing how to write converters for Qt's QString  class. In the end, you should have all the information you need to write and register your own converters. A Boost.Python type converter consists of two major parts. The first part, which is generally the simpler of the two, converts a C++ type into a Python type. I'll refer to this as the to-python converter. The second part converts a Python object into a C++ type. I'll refer to this as the from-python converter. In order to have your converters be used at runtime, the Boost.Python framework requires you to register them. The Boost.Python API provides separate methods for registering to-python and from-python converters. Because of this, you are free to provide conversion in only one direction for a type if you so choose. Note that, for certain elements of what I'm about to describe, there is more than one way to do things. For example, in some cases where I choose to use static member functions, you could also use free functions. I won't point these out, but if you wear your C++ thinking-cap you should be able to see what is mandatory and what isn't. Increment the reference count on the PyObject* and return that pointer. That last step bears a little explanation. Suppose that you didn't increment the reference count on the returned pointer. As soon as the function returned, the boost::python::object in the function would destruct, thereby reducing the ref-count to zero. When the PyObject's reference count goes to zero, Python will consider the object dead and it may be garbage-collected, meaning you would return a deallocated object from convert(). The first template parameter is the C++ type for which you're registering a converter. The second is the converter struct. Notice that this registration process is done at runtime; you need to call the registration functions before you try to do any custom type converting. From-python converters are slightly more complex because, beyond simply providing a function to convert from Python to C++, they also have to provide a function that determines if a Python type can safely be converted to the requested C++ type. Likewise, they often require more knowledge of the Python C API. The recipe I use for creating from-python converters is similar to to-python converters: create a struct with some static methods and register those with the Boost.Python runtime system. This simply says that a PyObject* can be converted to a QString if it is a Python string. Now, if you simply construct a single QString_from_python_str object in your initialization code (just like you how you called to_python_converter() for the to-python registration), conversion from Python strings to QString will be enabled. Failing to use borrowed() in this situation will generally lead to memory corruption and/or garbage collection errors in the Python runtime. Finally, a cautionary note. The Boost.Python type-conversion system works well, not only at the job of moving objects across the C++-python languages barrier, but at making code easier to read and understand. You must always keep in mind, though, this comes at the cost of very little compile-time checking. That is, the boost::python::object copy-constructor is templatized and accepts any type without complaint. This means that your code will compile just fine even if you're constructing boost::python::object s from types that have no registered converter. At runtime these constructors will find that they have no converter for the requested type, and this will result in exceptions. These exceptions  will tend to happen in unexpected places, and you could spend quite a bit of time trying to figure them out. I say all of this so that maybe, when you encounter strange exceptions when using Boost.Python, you'll remember to check that your converters are registered first. Hopefully it'll save you some time. This IPython notebook-based tutorial covers a lot of the major (and some of the more obscure) topics in Boost.Python. The Boost.Python wiki contains a lot of collected Boost.Python knowledge. And of course, the Boost.Python documentation itself is very useful. For example the Boost.Python FAQ. Boost.Python uniformly uses boost::python::error_already_set to communicate exceptions from Python to C++.. 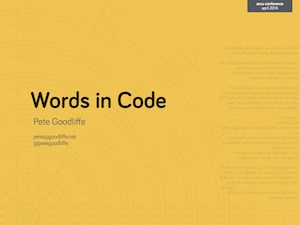 The slides from my ACCU 2014 talk, Words in Code, are available on SlideShare, from http://www.slideshare.net/petegoodliffe/words-in-code. As software developers we do not just write code. We write many, many words too. We write documentation, comments, manuals, specifications, technical articles, wiki documentation, and more. Maybe even magazine articles and books. This talk discusses some practicalities of writing well, both stylistically and practically. We'll talk about prose, but also about the right "geek" way of writing, the storage formats, toolchains, and the storage of our words. At the end of this talk, you'll have a good idea how to put together an example "document toolchain" taking source-controlled words in a humane markup style, and creating high-quality HTML, PDF (fully styled, print-ready) ePub and Kindle output, as well as Word-friendly versions.